A Feathercraft Klondike on Loch Veyatie near Stac Pollaidh, Scotland. Picture courtesy of Giles Butler. 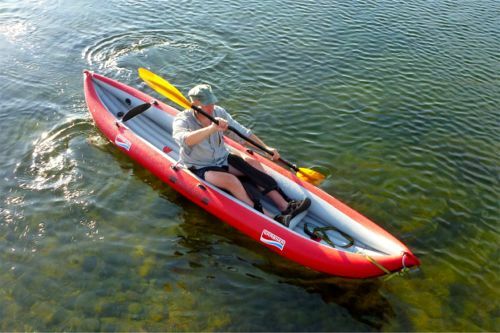 Folding kayaks have a heavy waterproof fabric skin over a collapsible frame or skeleton. They're wonderful if you want to travel by air with your kayak; or if you want to take kayaks on your yacht; or if you live in a city apartment and you find that a 17-foot long rigid kayak won't go up the stairs or into the elevator. A "folder" is easily tough enough to survive falling off a roof rack onto cement. 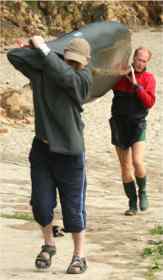 Most are no more affected by sliding over sharp rocks than the typical composite kayak. They're expensive, but then they have a lot of components. The frame will probably last 40 or 50 years with ordinary care (just look on eBay) and a good skin will last for 20 or 30 years. If you buy a traditional design which has been in production in the same factory since the 1920s, you can probably buy a replacement skin and give your kayak another couple of decades of life. Folding kayaks are not the perfect solution for everybody's kayaking needs. Apart from the cost, there's performance. The hull of a folding kayak may look nice and smooth out of the water but when it is afloat, water pressure makes the skin bulge in between the rigid parts of the frame so the underwater shape becomes lumpy. So, they are harder work than a rigid kayak. Folding kayaks made to military specifications are very, very heavy to carry. A lightweight folding kayak is likely to be weaker and less durable than a similar rigid kayak. If light weight is the most important factor on your shopping list, have a look at Inflatable Kayaks. All folding kayaks take time to assemble, anything from 15 minutes to an hour or more. The frames often include aluminum components which should really be washed in fresh water every time they are exposed to salty water, or even salty air. A good "sea sock" is a very good investment, because it keeps the inside of the kayak clean and dry. Or at least, it reduces the amount of mud and wet sand that collects in the joints and next to the skin. See Sea Sock. If you want a folding kayak for air travel, it's a good idea to re-check the maximum size and weight that your favourite airlines are willing to carry without extra charges. So far, most airlines have been happy to carry bags less than 62 inches long, but this can change at any time. It's safer to buy a kayak that fits into bags less than 57 inches, or 53 inches, or even 40 inches long. 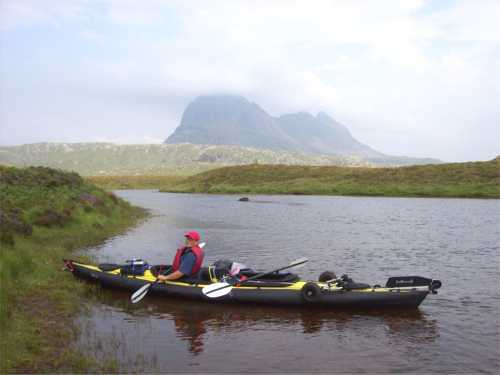 At each of those lengths, one or more folding kayak manufacturers fallsby the wayside. Only a few manufacturers sell a light folding kayak that fits in a bag less than 40 inches long. In this section, I summarize the main points about folding kayaks. For links to manufacturer websites see Kayarchy Shopping. The pieces that go from one end of the kayak to the other end are called longitudinals or stringers (or more specifically, the keel, chines and gunwales). They're usually made from solid wood or aluminum tube, but composite rod is also possible. The pieces that go across the boat are called ribs or frames. They're usually made from half-inch plywood, but they can be cut from solid plastic such as HDPE, or moulded in plastic composite. Wood or aluminum? One company that offers its customers a choice of wood or aluminum is Nautiraid in France. They find that an aluminum frame is slightly lighter than wood for the same strength (saving about 7 pounds for a one-person sea kayak) and that can be cheaper than a wood frame, but wood frames can be assembled faster. aluminum frames look modern, wood frames look traditional. Wood is easy to repair in case of accident. It needs to be kept varnished and kept reasonably dry between outings, or it will rot. aluminum needs less maintenance than wood, but it can still deteriorate fast if it's left salty. "Marine" grades of aluminum are fairly resistant to salt water, especially if anodized. The best material for the frame would be carbon fiber, because it's stiff, light and strong, but it's too expensive for most people. The hull skin of a good folding kayak is a very tough fabric, often the same material that's used to make inflatable white-water rafts and dinghies. It's a tough nylon or polyester cloth coated on both sides with a layer of synthetic rubber. 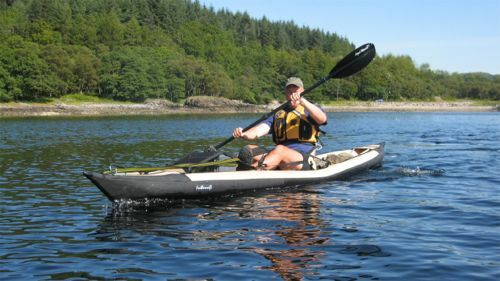 One manufacturer makes kayaks using urethane foil or membrane, which is a sheet of urethane with no reinforcing fabric. Inflatable buoyancy bags are made of vinyl foil. No doubt a single layer of foil is lighter and more flexible than a three-layer reinforced fabric, but I'm not sure I'd trust my life to it. For many years, all the good kayak manufacturers used fabrics coated with neoprene or hypalon (which are trade names for polychloroprene and chlorosulphonated polyethylene). These fabrics come in a range of thicknesses. They are heavy but very resistant to oil, salt and ultraviolet light. Here's a comment from Jack's Plastic Welding (whitewater raft manufacturers and repairers): "When I was a guide in the Grand Canyon in 1979, outfitters were still using neoprene and canvas (cotton base fabric) tubes. This material pre-dated the invention of nylon (before 1941). The reason they failed was because the canvas would rot inside of the neoprene, and they would loose their ability to hold air pressure. The coating was still OK." Neoprene can also be very resistant to abrasion, and hypalon is even better. Orca fabrics from Pennel et Flipo are excellent. Cheaper kayaks often have a skin of PVC (vinyl) coated nylon. This can be cheap and nasty (easily abraded, stiff in cold weather, disintegrates quickly in hot climates) but Valmex fabrics from Mehler Texnologies are durable, flexible at all normal temperatures, and hard to tell from neoprene-hypalon. Some of the best folding kayak manufacturers now use a coating of urethane, which is lighter. The soles of your shoes are probably PU - it's tough stuff. It's particularly difficult for a fabric manufacturer to get the chemistry and manufacturing process exactly right. If they don't get it right, the coating may peel off after a year or so. For example I've got some urethane drybags, from a very reputable bag manufacturer, that just fell apart while stored for 10 years in a cool, dark, dry closet; and a PU-coated backpack, again from a very reputable manufacturer, where all the PU fell off the base fabric within about 5 years. However if urethane-coated fabric is made just right, you get a folding kayak that's at least as tough as the others, and lighter. Most kayak manufacturers are very shy of telling customers how thick the all-important skin of their kayak is. If they give you a figure in "denier", that's just the base fabric, not the total thickness including the coating. The weave and weight of the fabric used in the hull is important, yes, but the single most important measurement is the thickness of the hull skin (fabric and coating combined). A thinner fabric will weigh less and fold up smaller, but it won't be as tough. Of course, not all parts of a hull are equally exposed to damage from rocks and sharp objects. Damage is always concentrated on the keel, the chines and the part of the boat directly under the kayaker's weight. As Feathercraft says "80 percent of the wear on a hull is directly under the keel and chine bars". By gluing or welding strips of fabric or flexible plastic onto the outside of the hull along the keel and chines, it's possible to double the thickness of the skin at those points. Another way to protect a skin is to stick strips of foam plastic inside the hull, between the frame and the skin. These stop the skin being nipped between a rock and a stringer, so it can slide over the rock without damage. 18 ounces per square yard (620 grams per square metre). Can be used to make lightweight tubes for very small RIBs ("rigid inflatable boats") but in kayaks this weight is best kept for making the deck. 26 oz (900 gsm) is good for light hull skins. It's also a common weight for vinyl-coated side curtains for articulated lorries. 28 oz (950 gsm). Zodiac make small inflatable dinghies from this weight. 29 oz (1000 gsm). Grabner make good-quality inflatable kayaks from this. 48-50 oz (1650-1700 gsm) is elephant hide for super-tough kayak hulls. Don’t expect to pack this kayak into a small bag, or to carry it a long distance without help. Folbot From 2012, Elvaloy, but hypalon hull still available. Polyurethane deck Hull was 1457 gsm hypalon, then 1100 gsm hypalon, then Elvaloy. Neoprene and hypalon hulls are assembled by gluing, which is a skilled process done by hand. The glue is expensive, the solvents are hazardous, there's a lot of preparation, and you need to be careful of temperature and humidity in the workshop, but I have done some repairs to hypalon hulls, and they were completely successful. Vinyl fabrics are usually welded, which requires expensive machinery. You can do a glue repair to vinyl at home and the glued joint will last 2 years, 5 years, who knows, but will eventually fail. urethane coated fabric can be either glued or welded. Fabric for the deck doesn't need to be as strong as for the hull, so it can be lighter, easier to fold up small, and maybe breathable too. It's likely to be either cotton (with a penetrating waterproofer as with a cotton tent) or a nylon or polyester fabric with a urethane coating. The skin of a folding kayak usually has very little stretch. If it's a perfect fit for the frame, you will never assemble it. The skin has to be a bit bigger than the frame. One popular way to make the skin fit is to have two inflatable tubes which go from one end of the boat to the other along the gunwale, between the frame and the skin. Called "sponsons", they are simply long, thin versions of the familiar buoyancy bag. When inflated, they help stretch the skin, eliminate wrinkles and give the kayak a smoother underwater shape. Some recent designs of folding kayak are light and a good shape for paddling and rolling (kayak A). Some of the Feathercraft range, for example, look as good as the best rigid sea kayaks and are nearly as fast. Most folding kayaks are built to bulkier designs (kayak B). They are heavier, wider and slower than a Greenland kayak, more like a Canadian canoe. Old-school folding kayaks have done some amazing things and so have the similar 50:50 paddling-sailing canoes. The black and yellow Feathercraft folding kayak shown in three photos on this page is rugged, beautifully made, can carry a huge load and is popular with air travellers. The same is true of the blue Klepper Aerius double, below, which has a huge worldwide reputation, has done many major expeditions on the open sea and is still used by various commando forces. The basic Aerius has a huge open cockpit which can be closed off to leave two individual cockpits. Accessories for the Aerius include a little mast, sail and rudder. The basic Aerius double is 17 feet long, 33 inches wide, 70 pounds, quite a nice shape and very nicely made. Ordinary kayak paddles are too short for such a wide boat, but they come with extra-long paddles. 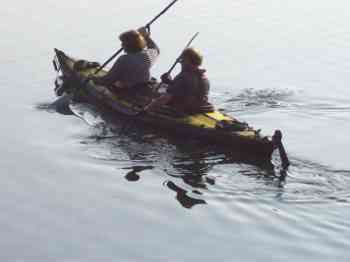 If you are used to rigid sea kayaks you will find an old-school folding kayak very slow on the water. Even without any load, very few people could roll one. Their cockpits are not designed to let the occupant(s) brace themselves in position or lean backwards during a roll. It would take federal legislation (or a big wave) to make an old-school folding kayak capsize in the first place, but if a kayak of this sort is to be used on the sea, it is essential that every cubic inch not occupied by equipment or the kayaker's legs be filled with inflated buoyancy bags. See Additional Flotation For Your Kayak. Anybody going to sea in a boat which could capsize and which they cannot easily right and empty should consider wearing a full inflatable lifejacket rather than a PFD. In cold water, it does not take long before you lose the ability to help yourself and then become unconscious. A lifejacket can be inflated in the event of an emergency and it will then keep an unconscious person's face above the water until rescue. See Personal Buoyancy. It is possible to build your own attractive, tough, durable folding kayak. • Tom Yost's inspirational site at www.yostwerks.com or www.yostwerks.org in which he gives detailed instructions for building many different styles of folding sea kayak. The site is also down at present (April 2015) but you can still find it on the Wayback Machine, for example here. 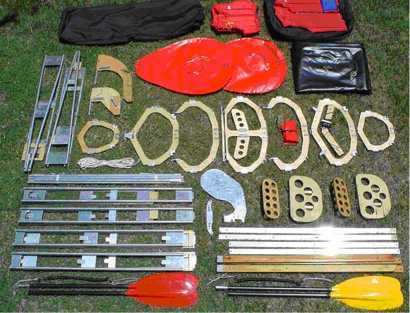 For everything you can think of on the subject of folding kayaks, see Faltbootbastelseiten. It looks at past and present designs; plans for sailing rigs of all degrees of sophistication; information about repairs; folding kayaks driven by paddles, oars and paddle wheels; folding kayaks powered by electric motors, petrol motors and steam engines; a powered kayak that rides on hydrofoils; folding sailing dinghies and a catamaran; origami kayaks; and an anti-"personal watercraft" weapon which we plan to build shortly. Mainly in German. Grateful thanks to Rainer Kumm for bringing this to our attention. You can carry an inflatable kayak in a medium-size backpack, and they've done some remarkable trips. 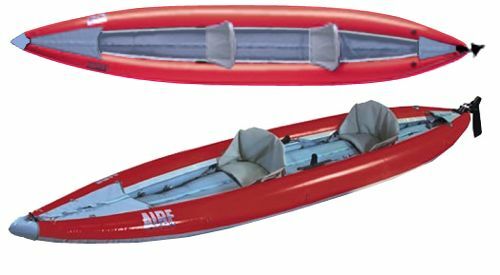 An inflatable kayak (IK) has the same benefits of portability as a folding kayak, and if anything can be a little lighter, and quicker to assemble. Most IKs are regarded as beach toys but a few manufacturers produce inflatable kayaks that are suited to coastal exploration. They include Aire (USA), Advanced Elements (USA), Grabner (Austria), Gumotex (Czech Republic, branded Innova in North America), Incept (New Zealand) and Sea Eagle (USA). The list also included Feathercraft (Canada), but they have now ceased manufacturing. Links at Retail Outlets - Sea Kayaks - Inflatable. Quality IKs are made from the same tough rubber- or plastic-coated fabrics as folders, and are built in three ways. Method 1: The hull is an outer cover made of zipped or open-ended sleeves to take removable and repairable sponsons or air bladders (like inner tubes giving a tyre its form). Examples include Aire’s 18 foot Sea Tiger double, weighing 62 pounds; or Feathercraft’s Java (15 ft 4 in, 37 pounds) and Gemini IKs. Method 2: Sections of the hull are glued, vulcanized or heat-welded to form a sealed ‘tubeless’ vessel of at least three chambers: a wide, flat floor; and two sides. Examples include Incept’s solo Tasman (14 ft 1 in, 37 pounds) and Pacific double, or Gumotex and Grabner’s Holiday series of IKs ((Gumotex’s Seawave is 14 ft 9 in and 37 pounds). Method 3: A third method had recently come into vogue using drop-stitch (DS) fabric technology. This is where the hull is composed of up to three flat inflatable panels (floor and two sides) whose board-like shape is constrained by thousands of drop stitches inside. A drop stitch panel is able to contain a much higher pressure (up to five times more than an IK) which results in stiffness like a hard-shell kayak, and so greater paddling efficiency. Some IKs only have a drop stitch floor with regular round tube sides, like Aires and some Sea Eagles, Advanced Elements, Aquaglide. A couple have all sections made of drop stitch panels, like the Sea Eagle Razorlites and the similar Kxone Sliders. The weight of DS IKs is no greater than other types of IKs, while speed efficiency, and certainly interior space are improved. The Aires and Feathercrafts are undecked, self-bailing boats – you’ll get wet but the boat won’t swamp. The Incepts include a zip-back deck with a coaming hatch to take a spray skirt, while Grabner offer strap-on spray covers for their boats. Once an IK gets over about 13 feet long, longitudinal hull flex can become an issue: lower pressure hulls as found on Gumotex will sag in the middle with a heavy paddler aboard and this can affect agility and swamping. Grabner and Incept get round this with relatively high pressures of 0.3 bar (4.5psi) and Incept, some Grabners and the Gumotex Seakers (Seaker 1 - 15 feet 9 inches long but 75 pounds!) use twin side beams instead of one big side tube to further aid longitudinal stiffness. This helps limit swamping but can also increase windage. Rudders and thigh braces are additional ways of improving control and paddling efficiency, and downwind sails are easily adapted to inflatables too. As for speeds, the fastest sea-going IKs are probably the slim but relatively tippy Feathercrafts (more an inflatable sit-on-top than an IK) and the super-stiff Incepts. Solo models can cruise at nearly 5 miles per hour in calm conditions. Punctures and slow leaks are actually much less of a problem than most imagine, although when the sharks are circling or swordfish breaching, being in an inflatable kayak can give you pause; the Incepts’ ‘PVC-U alloy’ skin is thin compared to hypalon IKs. An IK’s biggest drawback at sea is its susceptibility to high winds. Because it’s relatively light, buoyant and has a lot more hull above the water than a hardshell or folding sea kayak, it can get hard to handle in winds above Force 4. And when the sea gets rough an IK can’t cut through the chop as efficiently as a hardshell with a knife-edged bow, while flat-bottomed hulls give little secondary stability in side waves. Strong quartering winds will also cause an IK to weathercock, which even a rear load and rudder can’t overcome. And so, more than with other sea kayaks, you need to carefully evaluate weather conditions with an IK, but that merely takes experience and judgement. 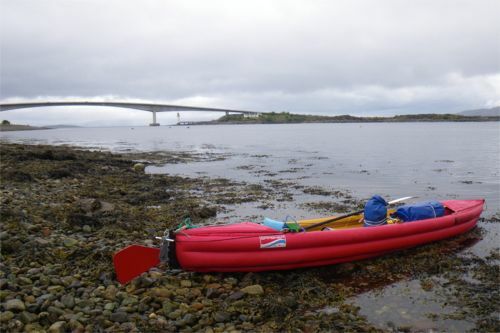 Over a couple of seasons experienced French kayaker Gael Auffret succeeded in paddling the 500-kilometre Scottish Sea Kayak Trail alone in a 20-year old Grabner Holiday 2. Capsizing is less of an issue and might be regarded as an IK’s safety feature, particularly for paddlers who don’t get on with the closed-in feeling of a decked hardshell. Although something like an Incept can be rolled, it’s often easier to get out and simply flip the boat over. Even if it isn’t self-bailing, an undecked IK will shed most of its water as you flip it back up. You then crawl back aboard, all in less than a minute; no balletic finesse, paddle floats or bilge pumping required. But the big danger in high winds is having your IK blow away quicker than you can swim after it. Over many decades IK legend Audrey Sutherland (her books are listed here) paddled 12,000 miles, often alone, in British Columbia, Alaska and Hawaii in a kayak on which the current Incept design is based. In rough conditions she always made sure she was tethered to her boat. Realistically, using an IK for a long sea expedition is thought to be an eccentric choice, especially in the UK. But for the less ambitious fair-weather coast-hopping that most sea paddlers engage in, the best IKs make safe, stable platforms for inshore exploration, and with a bit of creative packing can be transported anywhere in the world within regular baggage-allowance limits. • Aire Sea Tiger. I met one of these in Scotland, being used as a tender to a sailing trimaran. Powered by two strong kayakers, it was a nice boat even in the strong winds and currents of the Hebrides. It's slightly longer and wider than the Klepper Aerius described above, but lighter (62 pounds) despite being made of an extremely rugged 1100 denier, 24 oz per square yard fabric. • Why a long, narrow kayak?